Examples of good design are all around — in addition to classes, books and on-line sites. Just some careful observation on your part can translate to ideas for your own landscape project. For example, dry stream beds are a popular and useful design element. 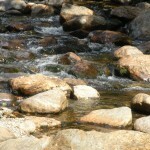 A well designed stream bed allows water to flow in a directed manner restricting erosion. And if we look to Nature as a teacher, the bed design should include rocks of various sizes and color. The random placement of rocks in a curved line to the lowest point on your property will mimic the stream beds we see at waterfalls and in creeks.